The year ended with the sad and sudden passing of Mayor Ed Lee, who had been working on behalf of San Francisco residents since the mid 1980s. The New York Times has a thoughtful obituary. Like Market Street, 6th Street is also in the midst of being redesigned to improve pedestrian safety. The Pedestrian Safety Project will reduce the existing 4 lanes of traffic down to 2 (one each direction from Market to Folsom), and introduce bulb-outs, new traffic signals, new landscaping and wider sidewalks. SFMTA needs your inputs on these design elements, and has a survey live on their website until the end of January; please give your feedback. You can find CMCBD's recommendations for redesign HERE. After receiving community feedback on the initial designs, the project will head toward the environmental review phase, and later go through public hearings and presentation to the SFMTA Board of Directors. Construction is estimated to being in 2019. Community Guide Ambassadors continue their work helping pedestrians with directions and information, as well as offering assistance to people in need of social service support. The gentleman below was provided with assistance getting to the District's CATS Medical Respite and Sobering Center for treatment. The Clean Team gets tremendous assistance from SFPD to quickly remove trash from District sidewalks and also works to remove graffiti before it multiplies. 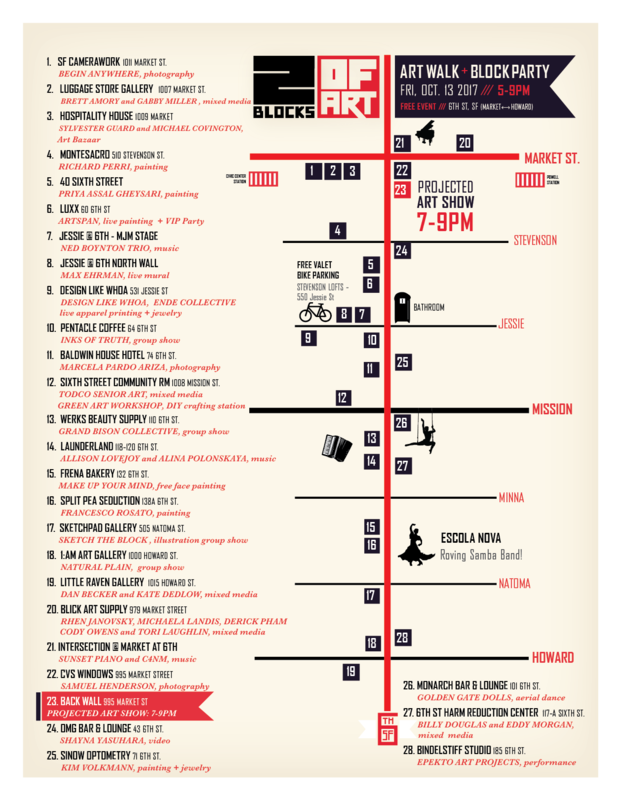 Superheroes, art, music and performances -- the 7th annual 2 Blocks of Art was a great success. The new large-scale, illuminated video art projection - Sixth Street Superheros was shown on the back of 16-story high 995 Market Street and served as its own art-themed bat signal, highlighting the artists, the local business community, the community-based organizations and the extraordinary people that make Central Market a vibrant destination for art and more. Peek at the map to see the full list of participants and check out photos to see some of the art. Of course the event wouldn't have been the success it was without its incredible steering committee, community partners and sponsors that include: Blick Art Materials, Kilroy Realty, Mikkel Svane, MJM Management Group, Shivshkati Foundation, SOMA Community Stabilization Fund, Stage 1075 , Streetplus, Studio O+A and VehicleSF, and founding partner Urban Solutions ! And a very special thank you to Episcopal Community Services, Bridgeton Holdings and our City agency partners Public Works and SFPD who went above and beyond to make this year's event a success. If you would like to get involved with 2 Blocks of Art 2018 please email us. The snowflakes returned! The festive lights went up on November 20, and will illuminate Market Street throughout the holiday season. This is the 8th year of the snowflakes, brought to us by Market Street Association. It was a festive evening at 6th and Market's Waystone wine bar on December 2, as the Central Market, Civic Center and Tenderloin CBD Boards gathered to celebrate the season and honor the work of staff and program partners. The event featured beautifully crafted bites and beverages curated and served by the venue's outstanding staff, along with award presentations, including CMCBD's Golden Brick Award. This year's Golden Brick was awarded to Trinity Properties and the Sangiacomo family for Piazza Angelo which includes - the 94-foot tall Venus - now the tallest piece of pubic art in San Francisco! See photos of the event here. CMCBD'S 2018 Safety Summit, geared toward District Facilities and Office Managers, will offer an active shooter training by Jason Garden of SFPD's Tactical Unit. The event will also feature multiple exhibitors from emergency preparedness organizations offering information and resources. The free event takes place 3:00 pm-4:30 pm Tuesday, January 30 at A.C.T. 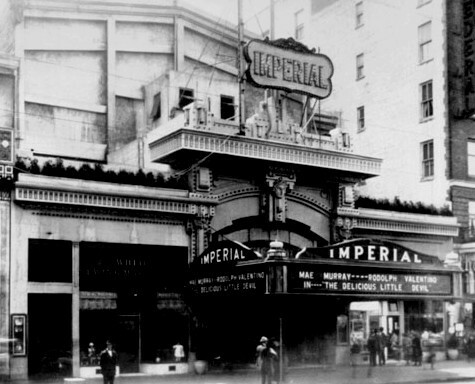 's Strand Theater. Registration is required. the new facade windows at Pentacle Coffee . T hank you for keeping the District beautiful.